The media may be mocking U.S. President Donald Trump's announcement of a new "Space Force," a sixth military branch equal to the Army, Navy, and Air Force, but this is no laughing matter. This announcement will kick off a moneymaking frenzy for companies operating at the nexus of space and defense. That's especially true for the small aerospace manufacturer we'll show you today. It's poised to benefit from 1,000% industry growth. There are roughly 1,100 active satellites currently orbiting the earth, worth potentially hundreds of billions of dollars. Satellites are essential to the functioning of the modern economy. They supply Internet connections, telecommunications, navigation, weather forecasting, and even surveillance. One spy satellite alone can cost upward of $400 million, while a typical weather satellite runs just under $300 million. And the costs of launching and maintaining these satellites run north of $10 million. The entire space economy is worth $329 billion, according to the Space Foundation. The Chinese government has already tested an anti-satellite missile system that destroyed a Chinese weather satellite during its test run. The United States and Russia have also tested similar anti-satellite weapons. Plus, a nuclear weapon has been tested in space back in 1958. The electromagnetic pulse from the weapon – which was only 1/35 as powerful as a modern nuclear weapon – damaged electronic equipment across a 1,300-kilometer range. And it had a satellite "kill radius" of 80 kilometers, which means today's weapons could wipe out satellites in a radius of 2,800 kilometers, roughly the radius of all of North America. "Directed energy" satellite weapons are currently in development. These weapons fire particle beams – similar to a laser – from space, which can destroy everything from missiles en route to stationary ground targets. They are also completely undetectable. That's not to mention the threat posed by "soft" power. Countries are employing surveillance satellites to spy on their enemies, creating jam-proof satellites to ward off attacks and keep communication lines open, and even floating the possibility of colonizing the moon or Mars. So far, the United States has been responding to these threats with a piecemeal approach banded across a number of government agencies and bureaucracies. While the proposed Space Force might sound like an entirely new undertaking, the Department of Defense has already been working on securing the space theater. The Naval Warfare Systems Command, Army Space and Missile Defense Command, and Air Force Space Command have all dedicated parts of their missions to space. A Space Force would bring these units under one dedicated military branch. But a dedicated Space Force would do a lot more than simply operate more efficiently. It would develop a professional military focused entirely on securing space, developing a comprehensive space strategy, and innovating best practices, according to Todd Harrison, the director of the Center for Strategic and International Studies' Aerospace Security Project. In fact, Harrison says the weaponization of space is already happening, thanks to America's adversaries. And while we don't know what the proposed Space Force will cost, since Congress will ultimately have to create the new branch, we can estimate. 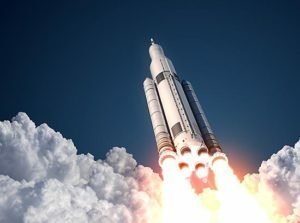 The Department of Defense requested $12.5 billion for space security in 2019, and the Air Force alone is expecting to invest $44.3 billion in space over the next five years. But that's just what the military is already spending. Establishing a dedicated military branch for space will ratchet up that spending markedly. If a Space Force will be on par with the other branches, as President Trump said, we could expect similar spending. The budget for the Air Force – the newest branch and most similar to the Space Force – came in at $170 billion for the last published year. That means military spending on space could surge by at least 1,000%. And that's going to create a massive windfall for the aerospace and defense firms who make space travel and defense systems a reality. You already know stocks like Boeing Co. (NYSE: BA) and Lockheed Martin Corp. (NYSE: LMT) are Money Morning favorites, and they'll continue to reap profits from higher military spending. But we've uncovered a company a mere fraction of the size of Boeing that could soar dramatically with the coming influx of cash. What happen if the US dollar no longer is the reserve currency in the world and the IMF's Special Drawing Rights take the currency centre world stage ? If the US dollar loses the Reserve currency status how does the US government pay its' bills and how can it fund its' defence budget and any new space systems and military defence systems ? The unknown is lurking in the shadows and the world monetary policy could change over night making the US poor as the UK became after Stering was replaced by the US dollar as the world's currency ! Could I have an answer to my queries ?